I have said it before, but I have yet to leave a performance of anything involving Joyce DiDonato without a big silly grin on my face by the end. This performance resembled the one of La Cenerentola that I saw last spring, in that 1. It also involved Juan Diego “Watch how long I can hold this high note! And now I’m holding it even longer! Did you catch that? No? That’s ok, because I’m still doing it!” Florez and 2. JDD did the usual grin-making JDD thing in the opera’s final big number (here, “tanti affetti”). I enjoy her performances of Baroque material more than the bel-canto reperatoire, but hearing her voice go zooming around in all that ornamentation is still a pretty rip-roaring good time. This is not an opera I know well. I’ve never seen it, and I’ve heard only the arias that tend to end up on recital programs, like the aforementioned “tanti affetti.” It is one of those 19th-century history-with-the-politics-taken-out operas – the story centers around a bunch of highlanders who are at war with James V of Scotland for reasons that are apparently unimportant; one of them, Ellen (Elena in Italian), is loved by both a highland chief named Rodrigo and this other guy who turns out to be James V; she prefers a mezzo named Malcolm, and it all turns out fine. I think Rodrigo dies, but that is probably not important either. Two stray observations about the staging. 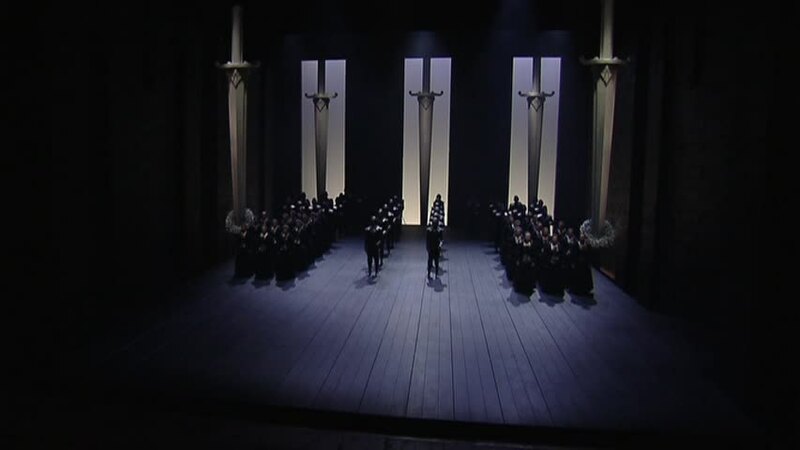 One, I think they stole the patch of barren heath that represents Little Mankie or wherever the hell this takes place from their production of Parsifal. Either that or the Met has two big movable patches of grayish ground that can split open in the middle. Two, during the first act when everyone is cheerfully celebrating the betrothal of Elena and Rodrigo that they assume will soon take place, Elena has to just sort of stand there looking agitated and twisting her hands together for quite a while – from the cheap seats, the stage direction gives the impression that Elena definitely doesn’t want to marry Rodrigo, and that additionally she really really has to pee. Finally, one unexpected bonus was mezzo Daniela Barcellona as Malcolm. She got overpowered by the orchestra now and then, but the solo moments, both early on and in Malcolm’s last aria in Act II were impressive – committed acting and some very smooth and well-executed Rossini singing. I have yet to attend one of Joyce DiDonato’s concerts or opera performances and not spend some portion of the program with a big stupid grin on my face. It took a while to get to the grin in this case, but it happened by the end. 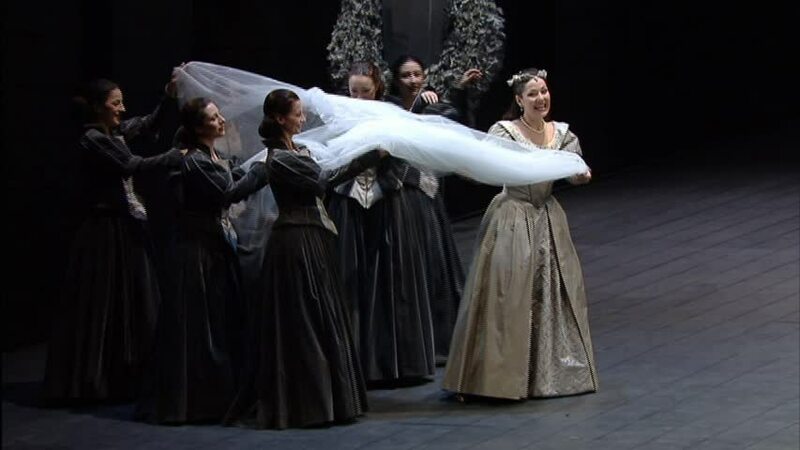 I had never seen this opera before or heard it the whole way through – there are bits of it, like Cenerentola’s last aria, “Nacqui all’affanno e al pianto . . non più mesta” that are recital staples and which I have heard before, but that’s about it. It’s a bit different from the Cinderella story most of us read as as small children. There’s no fairy godmother or wicked stepmother. Rather, Cenerentola lives with her stepfather and his daughters, and her trip to the ball comes because an angel witnesses her kind-hearted nature and decides to cut her a break. There’s no time limit, no magic carriage, and no glass slipper. Rather, C and her prince have a pair of matching bracelets. Which I will admit is rather sweet. And it’s not the failure of the stepsisters to get their big feet into C’s missing Jimmy Choo that nixes their chances: it’s that they’re obviously not very nice people. In addition, Cenerentola falls for the prince when he is disguised as his own valet (long story) and the story makes clear that she loves him because he’s a nice guy, not because he’s a prince. This is cute. Donizetti’s opera about a little girl raised by a regiment (alternate title: Eight Hundred Men and a Baby) who discovers that she is the natural daughter of a noblewoman and ultimately marries the young Tyrolean lad that she had fallen in love with in Act I is not necessarily what you would call deep, but it’s entertaining enough. Having Natalie Dessay in the title role doesn’t hurt either. I know she has recently said she is giving up opera, but I am not sure that I really believe this. I hope it’s not so. 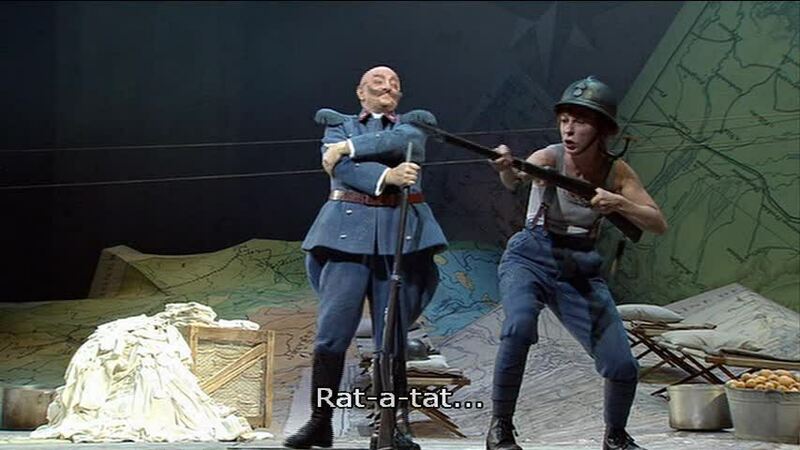 At the same time, watching her antics in this production led me to think about things French and antics in a general sort of way, and I had to wonder what would be like if you put in Patricia Petibon as Marie? I bet that would be entertaining too. I took no notes during the performance, but a series of things did occur to me afterward. They are merely impressions, not analytical points in any meaningful sense, so I think I’m still in bounds on this one. L’Elisir d’Amore is new to me. I’ve heard a few other of Donizetti’s operas, and they’ve struck me as terrific fun but not always deeply moving. Donizetti’s music at its worst can be somewhat repetitive. But when he’s on his game, you can have yourself a real good time.